The Klamath River is a hidden gem located in the northwest corner of California and southern Oregon. This website describes two runs on the Klamath, the Upper (Hells Corner) and the Lower (Happy Camp to Dillon Creek). Hells Corner is rated Class IV+ and the Lower is rated Class II - III. 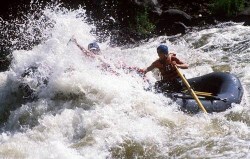 Both rivers require a varying degree of whitewater rafting skills. Consider contacting a commercial whitewater rafting outfitter. Portions of this website were excerpted from California Whitewater by Jim Cassady and Fryar Calhoun. Visit the "About The Books" page for more information about how to purchase this California whitewater rafting guidebook. This website is designed to provide logistical information to whitewater rafters to plan whitewater rafting trips and to serve as an educational and informational resource for guests, guides and the general whitewater rafting community on the Klamath River. This website provides camping information, shuttle directions, river descriptions, mile-by-mile guides and more. Remember this information can only help plan your trip..it cannot replace the skill and judgment needed to safely navigate these runs.